Jeremy Howard was nominated for a commendation for his role in the Army National Guard’s humanitarian effort. Most days, Jeremy Howard is preparing student athletes for healthy competition at Ave Maria University or teaching as an adjunct instructor at Florida Gulf Coast University. 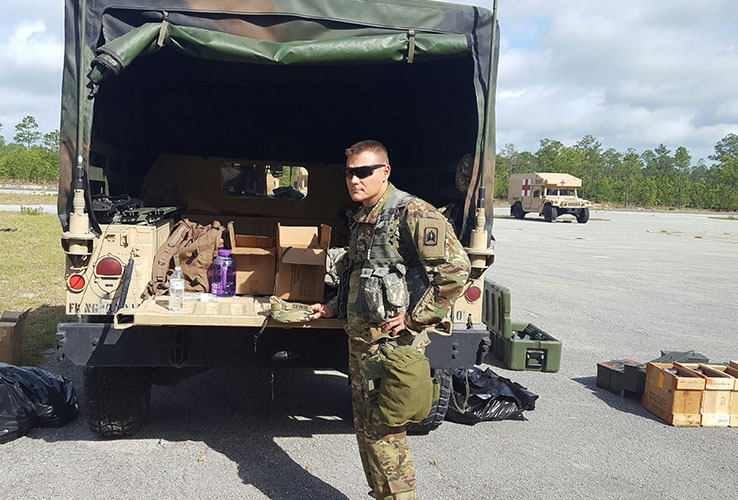 Two days before Hurricane Irma struck Florida’s southwest coast, the 2016 Master of Health Science in Athletic Training graduate was the assistant officer in charge of preparing an 18-vehicle convoy to provide support at shelters across the state. Recently promoted to warrant officer one, Howard had a major role in his Army National Guard unit’s mission. On the day before the hurricane, he and 17 soldiers helped open a Lake County elementary school as a shelter, checking in more than 300 civilians and 40 pets. The next day, they were in neighboring Pasco County, where Howard was the officer in charge for six shelters, including one where he and seven soldiers were stationed to ensure the health and safety of some 750 people. Two days after the hurricane, his role shifted again to supporting search-and-rescue missions, many in high water, in Arcadia and helping lead a food-and-water distribution site serving about 1,000 cars a day in DeSoto County. Finally, his role wrapped up closer to home in Lee County, where they provided food, water, batteries, and ice to more than 8,000 people in Lehigh, Ft. Myers, and Bonita Springs. For his leadership, Howard was nominated for a state-level military award. Read about Jeremy Howard’s work on return-to-learn protocols for student athletes with concussions.